Where is the Capital of Alabama? 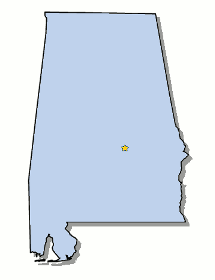 The Map of Alabama shows the location of the state capital in the "Heart of Dixie". Alabama has 67 counties, and the capital of the State is Montgomery. On a map, the capital city is always indicated by a star. Interesting fun facts about Montgomery including its history, location, county, current population, size of the city and the nickname of Montgomery. The Map of Alabama provides an outline of the state, which covers 52,423 square miles. The size of the state's capital city, Montgomery, is 155.4 square miles. Test your recognition skills of the map of the state, and knowledge of its capital, with our State Maps Quiz Game. The location of Montgomery is on the Alabama River south east of the center of the state, in the Gulf Coastal Plain. The city is located in Montgomery County. Each of the 50 states have their own capital city. The city of Montgomery is the capital of the state. The capital does not have to be the largest city in the state, but is usually centrally located either geographically or by population. 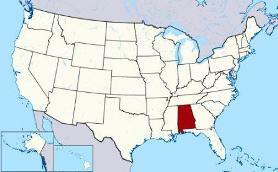 The State of Alabama is located in the south east United States on the Gulf of Mexico. Fact 3: The population of the capital city - 205,293. Its Nickname is "Capital of the South "
Fact 5: It is the county seat of Montgomery County. Fact 6: The city of Montgomery are served by the Public Schools system. Fact 7: It is the 103rd largest in the United States. Fact 10: Montgomery's area code is 334. The history of the capital is varied and, for a short period, it was capital of the Confederacy. It's history includes famous events such as the Jefferson Davis' inauguration. Montgomery was important during the civil rights movement as it was where the story of Rosa Parks and the bus boycott emerged. It was also the site of many non-violent protests led by Dr. Martin Luther King. The number of people, or the population of the capital city of Montgomery, obviously changes constantly but the government statistics for the 2012 population of Montgomery was 205,293, which provides a good indication of the number of inhabitants of the city. Old Alabama Town Museum, the Hank Williams Museum, Montgomery Museum of Fine Arts, Rosa Parks Library and Museum, the Mann Wildlife Learning Museum and the Dexter Avenue King Memorial Foundation. Weather: During the months of April - October, the city experiences periods of high heat and humidity. We hope that the interesting facts and information about Montgomery will help kids and school children with their homework. Learn more by playing the States and Capitals Game. Nickname "Capital of the South "